Are you ready for The Headless Descent? Halloween in Albion is filled with many exciting events. One of the most spectacular, and exclusive, ones is The Headless Descent. Participate for a chance at a Horse Macabre. The Headless Descent is a special time-limited event, coming to Albion Online. You will have to descend through a mysterious labyrinth, where you will face countless lethal dangers - but the possible rewards are well worth the risk. All those who reach the end of the Descent will earn 250 Pumpkin Pips when turning in their quest. On top of that, they also earn the chance to be raffled one of 10 Horse Macabre. All you have to do is to get through the unknown alive. Sounds easy, doesn’t it? Start your way down via a Teleport stone in the Underway. You will only be able to participate in this event on October 31, 19:00-22:00 UTC and November 1 02:00-05:00 UTC. But beware! You will not be the only one trying to reach the end! Other Adventurers will aim for the same goal - they might consider you an obstacle on their way down and just dispose of you. • You will (most likely) DIE during this challenge and face dangers never seen before in Albion. • Remember to pick up the quest located at the start of The Headless Descent for the Pumpkin Pip Reward. This quest can only be completed once per character. • Additionally, expect to come across everything from yellow to black zones - that also means full loot. Think about your preferred PvP flag beforehand. • Those with dreaded reputation must take the portal stones just outside Caerleon to enter. 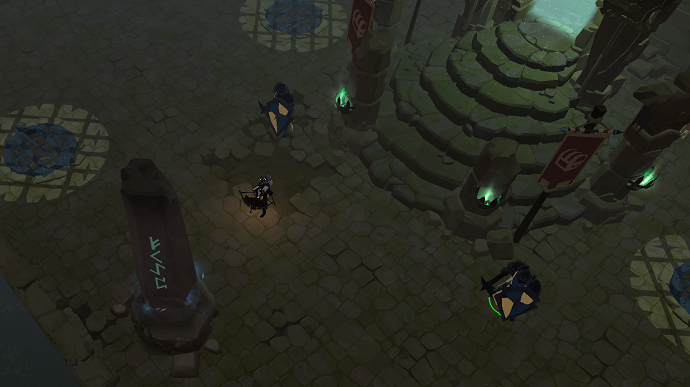 • Once inside, every teleport stone placed at the start of the levels will allow you to escape back to Caerleon. The Headless Descent will also be streamed live on our official AlbionTV channel on October 31, 19:00-22:00 UTC and November 1st 02:00-05:00 UTC.